On Tuesday, thespians from Ponteland Repertory Society kicked-off a five-night stint of performances with their latest production to Oliver! The Musical. 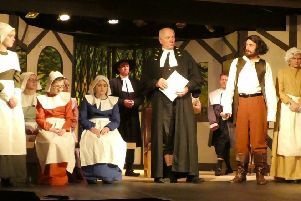 The successful local group has spent more than four months planning for its latest production. The story follows young orphan Oliver, who escapes life as an undertaker’s apprentice and heads to the mists of London. Oliver soon mixes with the wrong crowd and turns to a life of crime under the watchful eye of the Artful Doger and the ruthless Fagin. There are only a few more performances left of this classic show by this fantastic group, who have been performing plays and musicals since 1927. This year, lead performances come from Jonny Woollett as Fagin and Lucy Walton as Nancy. All the children in the performance are from The Preppies, the Rep’s youth group, with Lucy taking on the role of assistant leader of the group. They are split into two groups for the show. Local lads William Aycliffe, who lives in Scots Gap, and Cameron Davison, from Consett, are sharing the title role due to licencing rules. Oliver! is at Ponteland Memorial Hall tonight until Saturday. Tickets are available from £6. Visit www.pontelandrep.co.uk for further information or call 01661 871161.
l Read our review and picture spread in next week’s Morpeth Herald.